Okay, this is really one of my favorite dishes that my mom makes. My husband doesn't like casseroles, so I don't make this at home. I only eat it once a year (and then maybe leftovers for another meal or two) when I visit my parents in California each summer. My mom knows I absolutely love this and will make it just for me. God bless her. 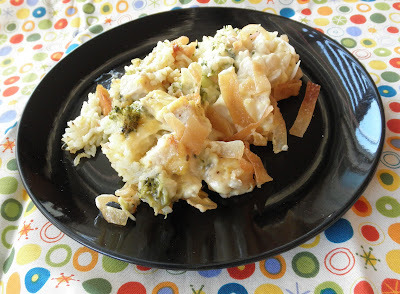 I think the other name for this dish is "Chicken Divan," but it's come to be called Chicken, Broccoli and Rice Casserole around here because it sounds less fancy. We're into not being fancy in my family, in case you haven't noticed. This meal is really salty (another reason I love it), creamy, meaty, crunchy, and just generally flavorful. It's another one of my comfort foods that just makes me happy. It's great for dinner AND for breakfast the next day. I always eat too much, and that's why I cannot make it at my house just for me and my eating buddy Ezra. If you make this, be sure to have at least three other people eating it with you, or you might make yourself sick on it, and that really isn't fun. Indulge in moderation is my motto. That's not an oxymoron or anything, is it? In a medium bowl, combine the soup, mayonnaise, wine, and curry. Mix 2 cups cooked rice with 1 cup of the above mixture. Evenly place the rice mixture in a 2-quart casserole dish or 9"x13" pan. Evenly place broccoli over the rice. Evenly place chicken on top of broccoli. Spread remaining sauce mixture on top of chicken. Bake covered at 375 degrees for 40-50 minutes or until center bubbles. Remove cover, and add top with fried won-tons and almonds. 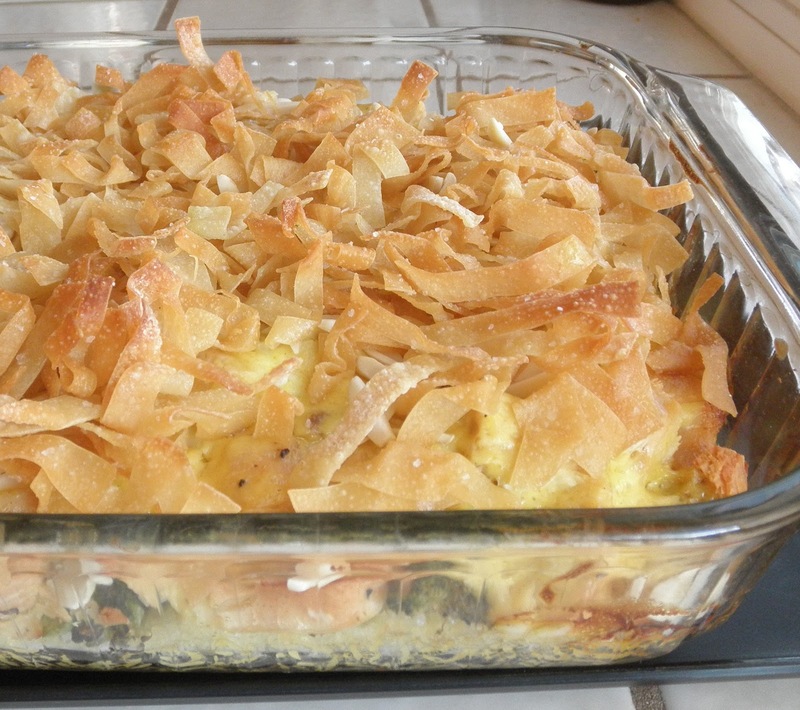 Return to oven and bake until top is browned (about 5-10 minutes). ***Can be made the day before, adjust baking time if baked cold.